Hi everyone! I would like to thank Meghan for this great opportunity to guest blog here this week – much appreciated! I love all things home, home décor, interior decorating and interior design. So when I saw Meghan’s posting looking for guest bloggers, I jumped at the chance. Life is busy these days, balancing life, work and family but interior decorating has become one of my underlying passions that I didn’t realize burned inside me. 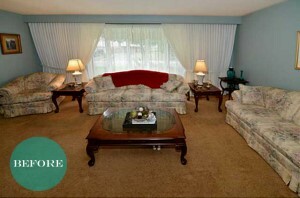 Today, I’m going to share a little bit of a recent interior decorating project I did for special clients of mine. My clients were moving from Toronto to Burlington, Ontario (45min outside Ontario’s capital city). 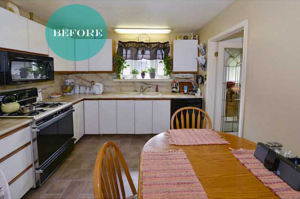 They wanted a bigger backyard and slower life pace for their twin girls and themselves. So they bought a bungalow that was still decorated circa 1970s. It needed a complete makeover! We worked together in choosing paint colours to brighten up their new space, modern furniture and accessories that suited their tastes to make this house their very own, new home. 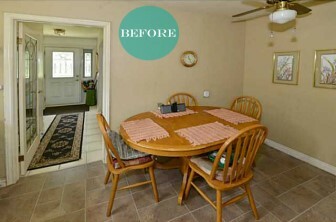 Below is a collection of Before and After photos from the different parts of their home. With little twin girls and two working parents, we wanted to create an entrance that would work for our clients in the mornings as they rush out the door to work and daycare, and when they come home from a tired day. 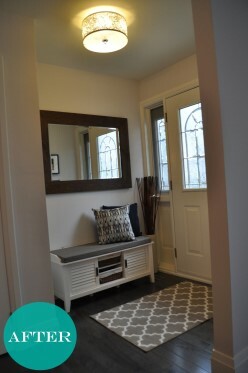 A warm, yet functional, entryway awaits them now. This is what it looks like now! 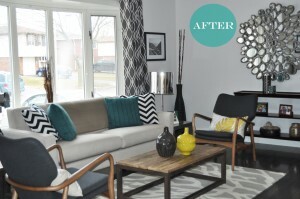 A modern living room look and feel! 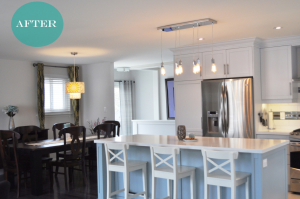 My clients wanted an inviting living room where they could relax, indulge and entertain with their twin little girls. All the while looking through their big bay window to welcome in the natural light. 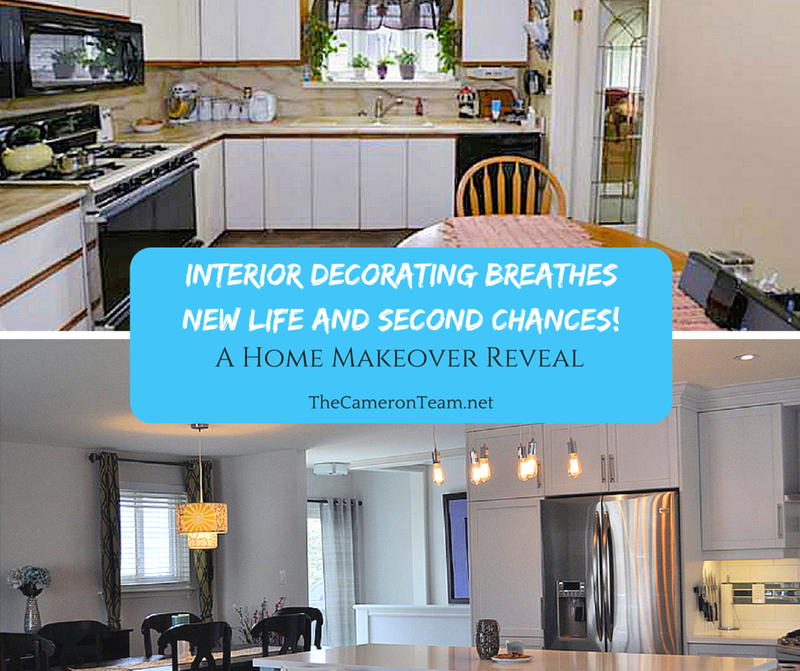 Our next stop … their newly-renovated Kitchen and Dining Room – fresh, stylish and sleek! Kitchen layout as it was before. 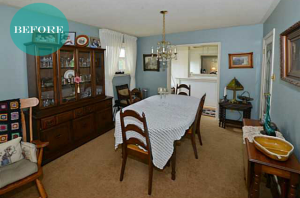 A wall had separated the Dining Room from the Kitchen Area. Now, we move into their Master Bedroom…. 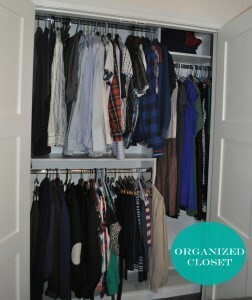 As they were moving from Toronto to a small home, they still needed to find a place for all their clothes. 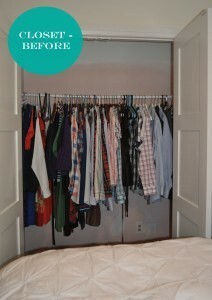 We turned to Closets By Design to maximize all the space they could get from their Master Bedroom Closet. 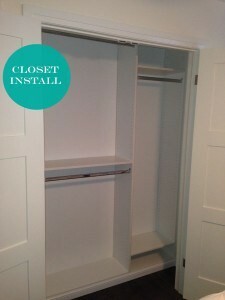 Master Bedroom – Closet Install by Closets By Design. Ahhh … gotta love organization! Client Master Bedroom … doesn’t their bed look so cozy! 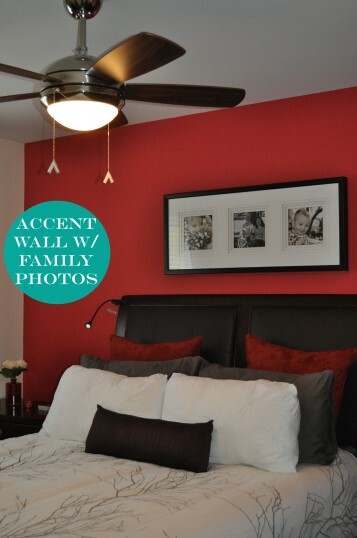 Our clients embraced the idea of having an accent wall in their bedroom so we went with Benjamin Moore’s Watermelon Red to invoke a bold yet passionate statement as you step into their bedroom. Their surrounding walls are Benjamin Moore’s White Cloud; a nice peaceful balance for them to unwind in at the end of a long day’s work. 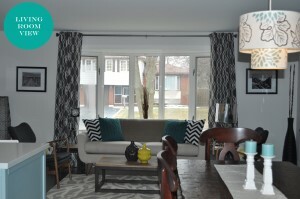 I hope you’ve enjoyed the home tour …if you would like to see more from this client renovation project, head on over to All in Place to read up on my previous blog posts from this project series. Hi, my name is Rosita and I’ve been blogging on my All in Place blog since 2013. 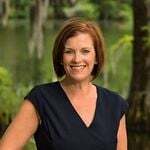 My blog topics include teambuilding, event planning, marketing and communications, but also my passion for home décor and staging. It’s a platform for me to creatively express my opinions, viewpoints and have some fun writing on what I love to do and see. I run All in Place Communications and Creative Design in Hamilton, Ontario, Canada. We are a small business focused on helping our clients with their marketing, branding and communication needs. As well as interior design services for residential and/or commercial spaces. Please LIKE us on Facebook to stay up-to-date with our latest news, projects and updates. Follow us on Twitter via @AllinPlace_Comm.